“It is big enough to bathe temple elephants” : Vivekananda Kendra, which is working on ‘Green and Clean Rameswaram’ project, has discovered two ‘theerthams’ (venerated waterbodies) — Chinnatharavai Bramha Gundam, popularly known as ‘Bramha theertham,’ and Parasuramar theertham in Rameswaram island. After discovering ‘Dharmar theertham,’ named after one of the five Pandavas in the island last year, the Kendra discovered the two new ‘theerthams’ on Saturday after making strenuous efforts with the help of a map given by the temple authorities and inputs given by elders. The Kendra launched the project last year under Natural Resources Development Project to discover and renovate all the 64 ‘theerthams’ in the island, which were either disappeared after being in disuse or filled with sand due to gusty winds in the last 60 years. “We plan to unearth at least five more ‘theerthams’ before the onset of monsoon next month,” V. Saraswathi, Coordinator of ‘Clean and Green Rameswaram’ project told The Hindu . The Kendra engaged more than 80 volunteers from Appar Arutpani Mandram and other bodies from Tirunelveli, Kanyakumari and Tuticorin districts for digging and renovating the waterbodies, she said. 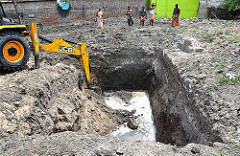 After digging just two foot, water gushed out from ‘Bramha theertham,’ which had unique white clay, once used for making ‘namakatti’ and given as ‘parasadam’ to devotees, she said. With this, 19 water bodies had come to the fore in the island, thanks to the support of the district administration, Ms. Saraswathi said. “We want to discover all the 64 ‘theerthams’ in the island during the five-year project period,” she said. The Kendra had already completed a survey of the waterbodies, she said. Under the ‘Clean Rameswaram’ project, Hand in Hand, a non-governmental organisation, has taken up solid waste management and CPR Foundation was taking care of 1,600 saplings planted around Mangala theertham in Thangachimadam, she said. As part of promoting renewable energy, solar lights had been distributed to fisherfolk in Dhanushkodi and about 100 kitchens in the island were given biogas connections for cooking using kitchen wastes, she added. Kanyakumari-based Vivekananda Kendra has discovered two more sacred wells (theerthams) in Rameswaram -- Chinnatharavai Bramha Gundam (Brahma theertham) and Parasuramar theertham. Kendra workers and volunteers, who have been working on a 'Green and Clean Rameswaram' project for the last one year, have discovered 20 wells so far. The wells they had discovered earlier include Dharmar theertham,' named after one of the five Pandavas. The kendra began the task last year, under the Natural Resources Development Project, to discover and renovate all the 64 'theerthams' on the island, which either disappeared after being in disuse or filled with sand due to gusty winds. They discovered wells after making strenuous efforts with the help of a map given by Ramanathaswamy temple authorities and with information provided by aged people in the area. "We are working around a 5km radius outside the temple. So far we have discovered nearly 20 wells or theerthams in the last one year. Most of these wells are covered by sand and garbage or some encroachments," kendra secretary G Vasudeo told TOI over phone from Kanyakumari. Fifteen workers are involved in the search for wells outside the temple. "The workers are involved in cleaning and greening of the island. Apart from them, some volunteers are also involved in the task," Vasudeo said. "We started with 10 volunteers from our Kendra. After a while, many local people joined us and now they are contributing towards cleaning several wells. Many local people had not known about these wells earlier," he said. "The elders of the island are helpful and guide us in our work. But there are some individuals who refused to share information as they might be squatting on the well after covering it. In such cases, it takes more time to do research and find the well," Vasudeo said. On Saturday, the workers dug two feet, and water gushed out of the 'Brahma theertham,' which had unique white clay. The other well -- Parasurama theertham' -- is very big since it was meant for elephants. As the teerthams are revived, the local community is using the water for daily use as well as for rituals. Many of the teerthams are also situated near the local village shrines and sacred trees. "Once renovated, the wells hold enough water despite poor monsoons," he said.